UFC Fight Night 108: Swanson versus Lobov turned out to be a good night of fights despite its curious headliner. While Artem Lobov came out earning much goodwill for lasting the full five rounds against a top five featherweight, it was Mike Perry who stole the show in his heart stopping second round knockout victory over Jake Ellenberger. Perry rebounded from a trouncing at the hands of Alan Jouban in December of 2016 and looked considerably more reserved and thoughtful in this contest. Well, at points at least. In the opening seconds of the fight Mike Perry showed himself to still be the MMA community’s favourite wild man by immediately trying to crane kick Jake Ellenberger in the head and getting taken down off a naked, full power low kick seconds later. But Perry showed activity off his back and quickly scrambled up as Ellenberger struggled to consolidate half guard. When Perry got back to it, he actually began to show new skills and a degree of technical ability in striking that was absent in his previous performances. Against Danny Roberts, Hyun Gyu Lim and Alan Jouban, Perry had waded forward, loading up right hands and eating punches and kicks as he did so. Against Ellenberger, Perry began showing new weapons. Most significant of these was the gorgeous skip-up left kick that he used to attack both Ellenberger’s lead leg and Ellenberger’s body throughout this bout. Moreover, Perry was flicking out long, non-committal jabs which served to bruise up Ellenberger’s face in the first round. But these moments of lucid striking science were punctuated by returns to the classic Platinum Mike method. For every couple of slick step-up kicks, or swift jabs put in, Perry would leap forward with a left hook, his right hand dangling down by his nips and his jaw inviting an easy counter. Perry also wound up pitching a right hand from all the way behind him over and over again, throwing his head a good three feet in front of his hips as he did so. It made for bizarre viewing as Perry would go from lunging wild and throwing himself off balance, to applying three picture perfect kicks, each setting up the next between feints. 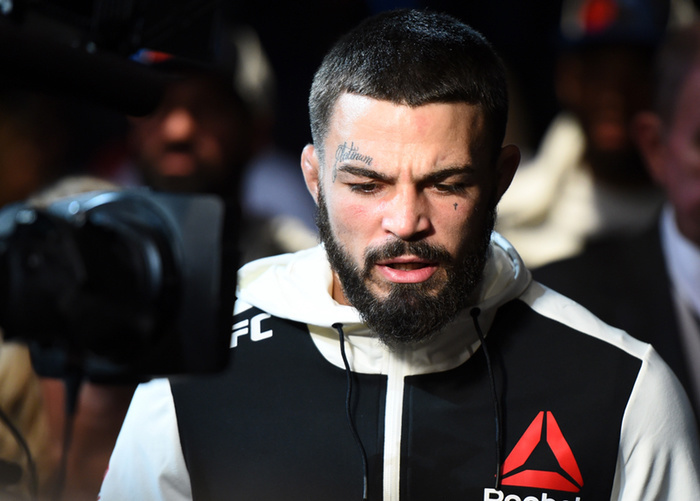 Midway through the first round it seemed that the fight was as much between Mike Perry’s coaches and Mike Perry’s emotions as it was between Perry and Ellenberger. While Jake Ellenberger threw the odd kick, he failed to exploit Perry’s narrow stance. Perry stood with his heels almost on a line and this typically makes a fighter very susceptible to having their balance broken with low kicks. Yet Ellenberger threw zero low kicks in this bout and it was Perry offering up the multi-faceted attack. But Ellenberger did show a nice left round kick to the body. Ellenberger would begin in his usual orthodox stance, circle out to his left while retreating into a southpaw stance, and fire the kick into the open side before his man had recognized the change. Giga Chikadze, a kickboxer whom Ellenberger has apparently been training with, is masterful at hiding changes to stance to set up this power kick into the open side. Throughout the bout Ellenberger was trying to time his right hand as Perry stepped in, and in the second round he was able to knock Perry onto his hands—though this might have been just as much to do with Perry throwing himself off balance. In any case, Ellenberger rushed Perry to the fence and bloodied him up nicely. As much as Perry’s touches of scientific striking seemed to fluster Ellenberger through the first round, it was a return to all out violence that finished the fight in devastating fashion. Blood freshly running from his nose, Perry immediately jumped in with another hands-low left hook which wrong footed Ellenberger and sent him to the mat. As Ellenberger rose, Perry dashed in behind that step up kick once again, landing in a clinch and as the two men struggled he landed a picture perfect sneaker elbow on the break. Elsewhere on the card we were treated to some truly bizarre striking. The less said about Alexis Davis vs Cindy Dandois the better. Marcos Rogerio De Lima and Ovince St. Preux spent the better part of ten minutes throwing kicks at each other from a distance where neither man could connect. And finally Diego Sanchez came out showing the exact same reaching, alternate pumping of hands that he has throughout his entire career, against another opponent who was in position to pick him apart for it. Al Iaquinta seemed well versed in dealing with southpaws. Ray Longo’s other famous charge, Chris Weidman, fought his first orthodox opponent in five years the other night so you would expect that gym to have a few good ideas about how to deal with lefties. Iaquinta looked in control as he checked and smothered Sanchez’s lead hand while circling his lead foot outside of Sanchez’s to give himself the clearer line. Getting the lead foot outside the opponent’s places the rear shoulder inside of theirs, securing the winning line on the rear hand. Getting the shoulder inside of the opponent’s can be done with the feet level, but is far easier with the lead foot on the outside. Having control of the opponent’s lead hand gives a good read on what he is going to do. If he wants to hit with his rear hand, his lead will likely be pulled back out of the way. If he wants to hit with his lead hand, he has to free it. If he gets frustrated, he might drop his lead hand while in range. A good answer to all of these is to throw the rear hand as fast as possible whenever the opponent’s lead hand starts doing something meaningful or moves away. As soon as Sanchez dropped both hands to swing that long, telegraphed right hook, Iaquinta’s shorter right hand hit him like a bullet. The second knockdown came as Sanchez attempted to throw his left straight and Iaquinta’s occupied the dominant line. Once again the simple control of the lead foot and hand shows why it is the bread and butter of southpaw vs orthodox strategies. It was another sad moment in the career of Diego Sanchez which has been a predominantly sad tale for the last five years. While he is still a joy to behold on the mat and a fan favourite, it is hard to watch Sanchez take so much punishment so late in his career. But the fight game is one that will happily milk a fighter for everything he has if he can sell even a few tickets.